During low water conditions, generally mid-December to August, we will not be able to sail across Tonle Sap and will fly from Phnom Penh to Siem Reap. No sightseeing will be missed. Low water conditions vary from year to year, so this will be evaluated on a cruise-by-cruise basis. Participation in this vacation requires purchase of the following flights from Avalon Waterways, not included in pricing: (1) roundtrip air from your U.S. gateway and intra-vacation air segments; or (2) intra-vacation air segments only, starting at $364. 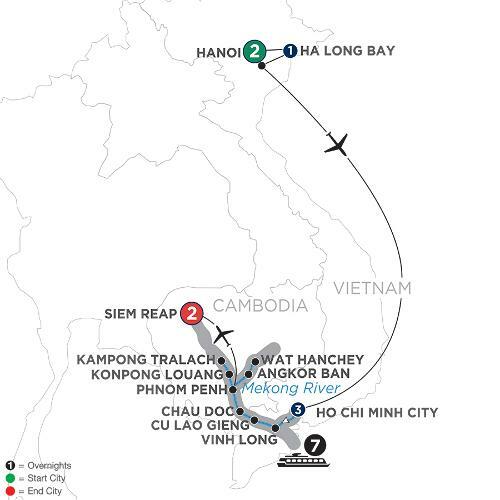 Required intra-vacation air segment: Hanoi/Ho Chi Minh City. Air prices were effective on February 7, 2018 , and their availability is limited. At the time you purchase your tour, air prices may be higher.